Great Food and Reasonable Prices! 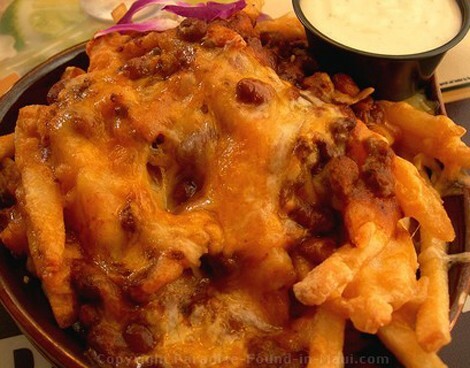 Moose McGillycuddy's is a great choice if you're looking for fun, casual, reasonably priced Lahaina restaurants that will make sure you don't leave hungry! 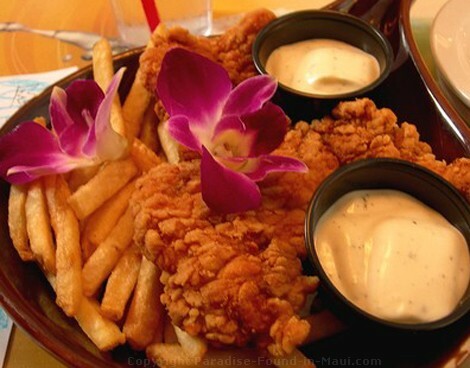 50% off and 2-for-1 coupons for Maui restaurants, activities and more! Every time we've been to this Front Street institution, they serve up very large portions of delicious food! 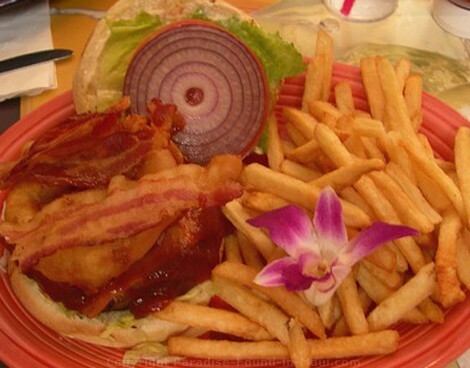 We've enjoyed their scrumptious breakfasts (perfect for filling up before you depart on one of the many boat trips from Lahaina harbour) as well as their burgers, fries and salads for a filling lunch or dinner! On a recent Maui vacation, we found ourselves once again walking down Front Street, totally starving after tons of sightseeing, and debating which of the many Lahaina restaurants to go to for lunch. Moose McGillycuddy's was right there in front of us and knowing how much we'd enjoyed it in the past, we decided to go again! Chicken fingers and fries for our picky pre-schoolers, fabulous chile cheese fries for me (if you feel like eating something that is sooo bad for you, but yet soooo delicious, try these... they were fantastic! 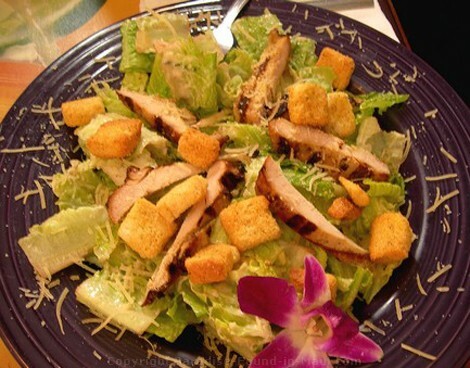 ), a bacon cheeseburger for my mother-in-law, and a chicken caesar salad for my husband, and we were all set! Besides the great food and views of Front Street down below, do you know what I really loved about it? They put plumerias on EVERYBODY'S plate to decorate the meal - you know you're in Hawaii when that happens! 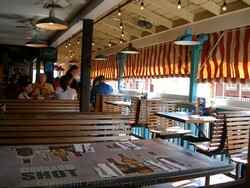 They serve a great selection of appetizers: standard fare such as calamari rings, sliders, nachos and the like. Plus a few you-know-you're-in-Maui items like Kalua Pig Quesadillas and Maui Onion rings! They also serve an assortment of salads, sandwiches and burgers. Plus, they have some specialties: items like their Mahi-Mahi Macadamia, Fisherman's Platter, Sirloin Steak and Fijitas! If you'll be there for dinner, be sure to ask about their nightly dinner specials since they can offer some good value! They also have a nightly happy hour with some great drink specials. If you end up at this Lahaina restaurant for breakfast, you'll have a choice of breakfast burritos, omelets, eggs, Hawaiian French Toast, the Hearty Hawaiian Breakfast and more. They are open 7 days a week, starting at 7:30 a.m. for their hearty breakfasts! They stay open all day serving lunch and dinner - you can get a late dinner served to you as late as 10 p.m. After 10 p.m. the DJ's come out and they turn the place into a fun stop for dancing and drinks! 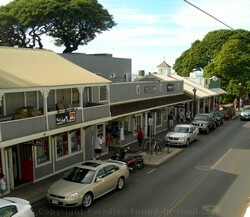 They are located at 844 Front Street, Lahaina. To get there, drive along the Honoapiilani Highway until you see the Shell Station at the intersection with Lahainaluna Road. Turn towards the ocean on Lahainaluna Road. When you get to Front Street, turn right. If you're staying in South Maui and don't feel like driving to Lahaina, another option for you is their newer location in Kihei at 2511 S Kihei Rd. If you're lucky and find a vacant parking spot on a nearby street, you can park there. But since the street parking is usually full, you'll probably end up parking in paid lots as we usually do. The closest parking lots to Moose's are located in Wahie Lane. It's pretty much right around the corner from the restaurant. If those parking spots are full, another option is parking on nearby Lahainaluna Road - there are parking lots across the street from Gerard's Restaurant. It'll be a bit more of a walk, but since the weather in Maui is usually gorgeous, I doubt you'll mind - I know we don't! 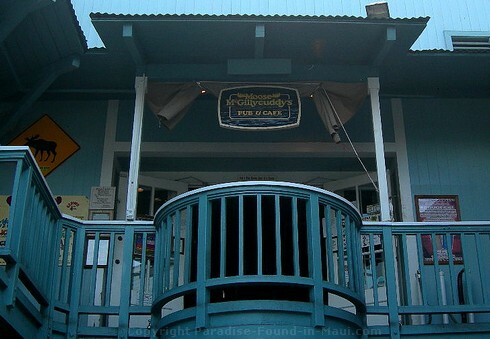 Lahaina: Fun Things to Do and See, Where to Dine and More!